For a moment it was cloudy, windy and foggy with almost zero visibility, the other moment sky cleared up, the fog vanished and it left behind astonishing views of the snow cladded mountains of Kinnaur Kailash range. 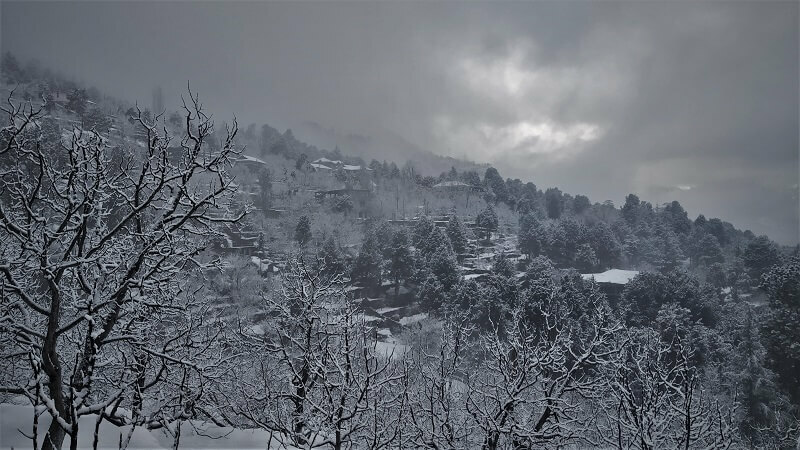 At one moment, the sun was shining bright causing the Kinnaur Kailash to glow golden, the other moment it started snowing heavily and the entire town was covered with a thick blanket of snow. It seemed if someone has painted a town entirely in white colour. And yes, it all happened in a day’s time. Is travelling all about visiting a particular destination which will have spots of tourist interest. 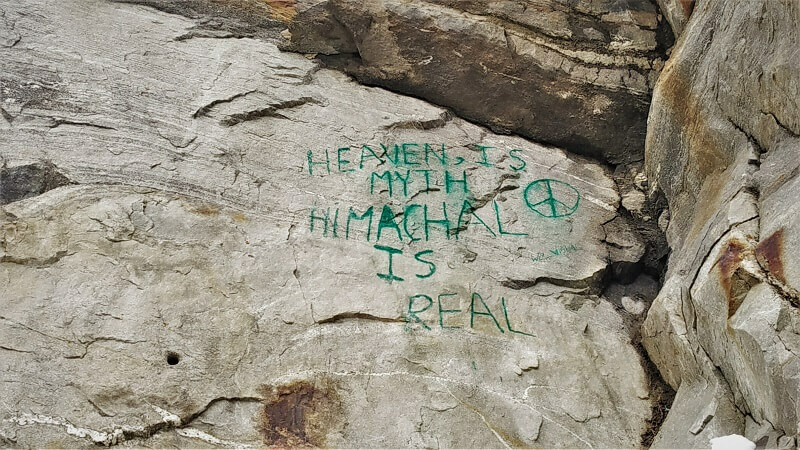 If you are that kind of traveller, you would be left disappointed on your visit to the state of Himachal. 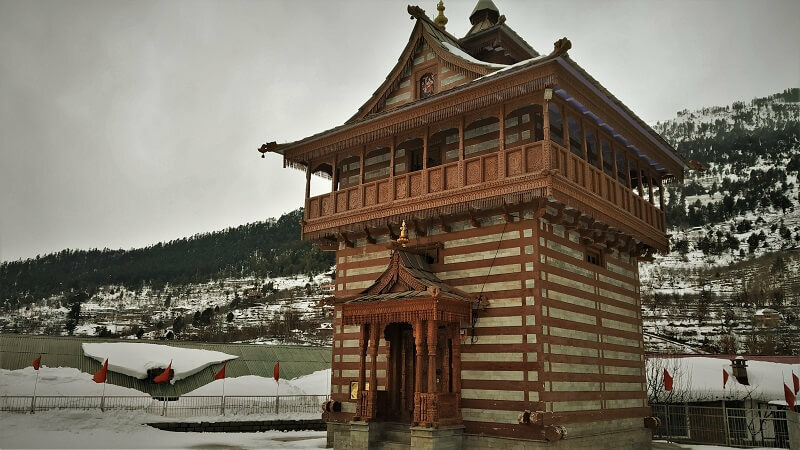 Travelling to Himachal is more about experiencing natural beauty rather than visiting particular touristy spots. It the overall journey which creates memories and not a particular destination. Kalpa in Himachal is a perfect example. 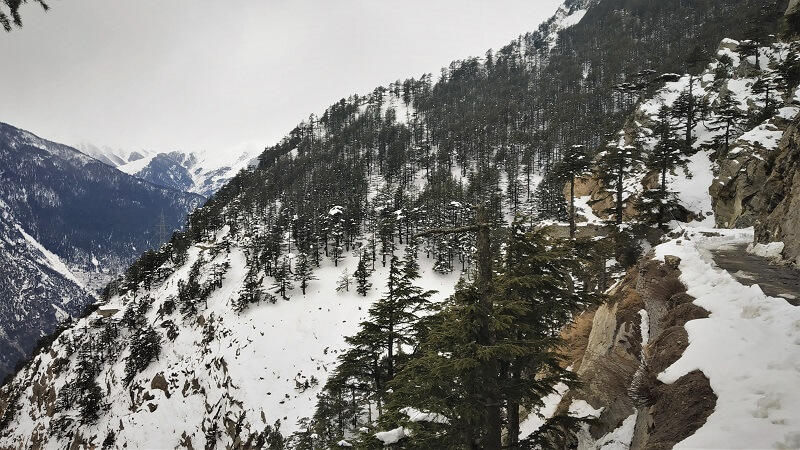 Located around 570 kms from the capital city Delhi, in the Kinnaur district of Himachal, Kalpa stands at an elevation of around 3000 meters. 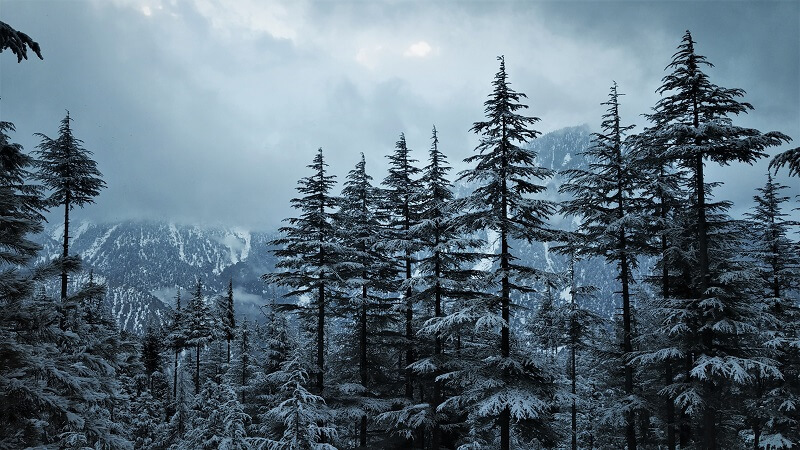 Due to such an altitude, it remains cold throughout the year. 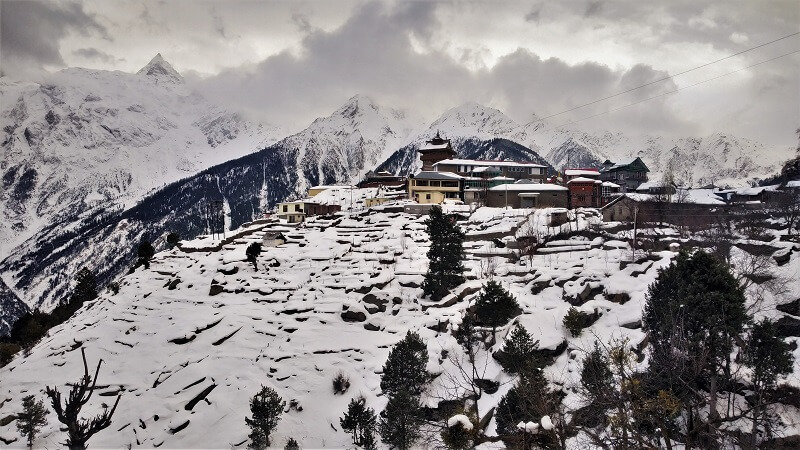 Kalpa is a pure scenic bliss that one can never get enough of. 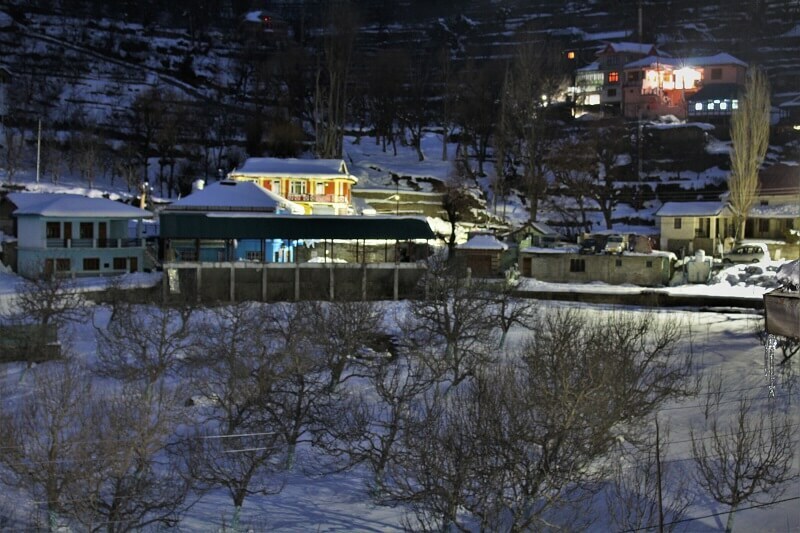 The town sits on a high promontory with absolute majestic views of the Kinnaur Kailash range. Wanna taste one of the best apples in the world, make a visit to the beautiful town of Kalpa. 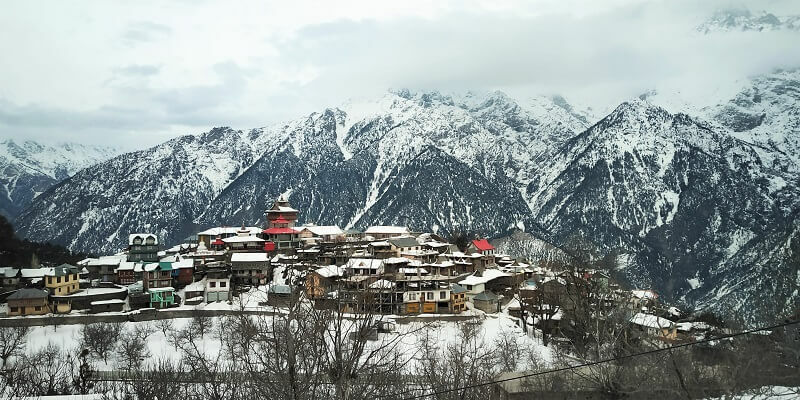 How to reach Kalpa in Winters? 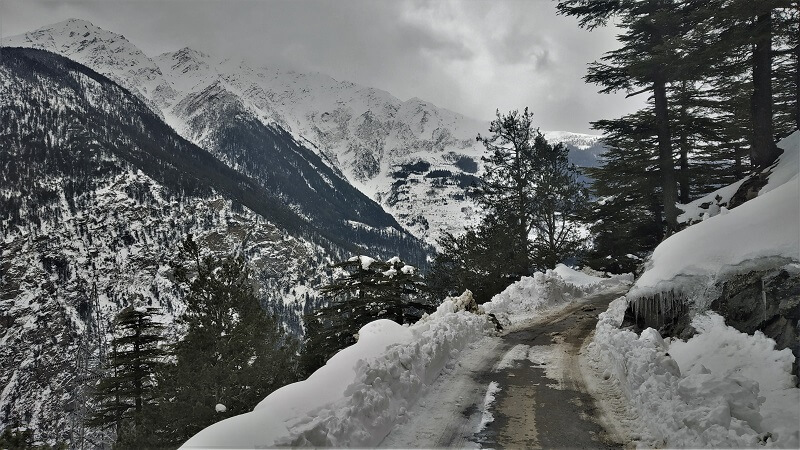 There are two ways to reach Kalpa, one via Shimla route and other via Manali route. 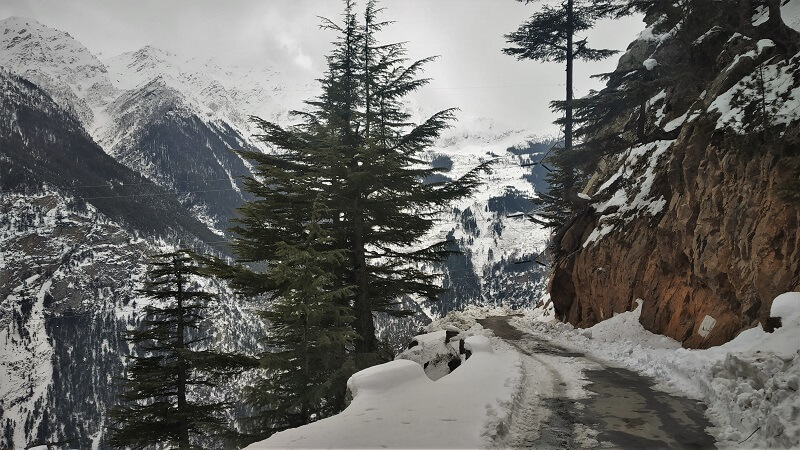 Manali is the longer one as one has to cover the entire Spiti Valley to reach Kalpa and also the route remains closed in winter season. 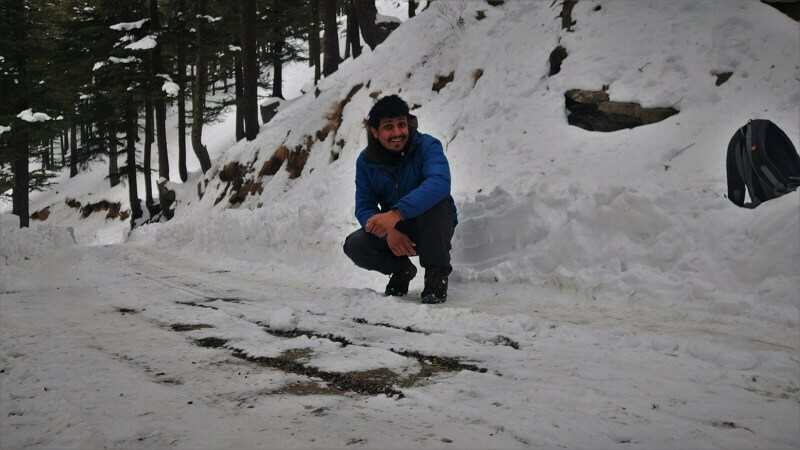 If you are doing the entire Spiti circuit, you can choose that route, I will only be discussing about the Shimla route. Chandigarh is the nearest major railway station to Kalpa which is located at a distance of around 330 kms (11 hours). 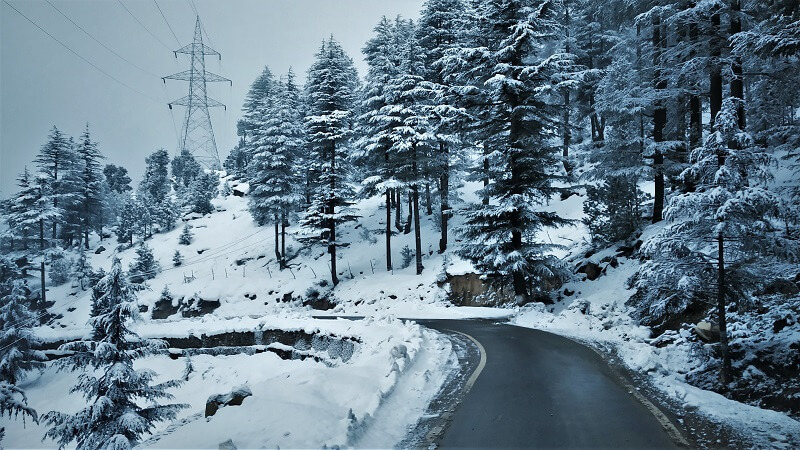 From Chandigarh, you can take an HRTC bus for Shimla (112 kms – 4 hours). From Shimla, you can catch an HRTC bus for Reckong Peo(220 kms – 7 hours) from where Kalpa is just 10 minutes’ drive (3 kms). 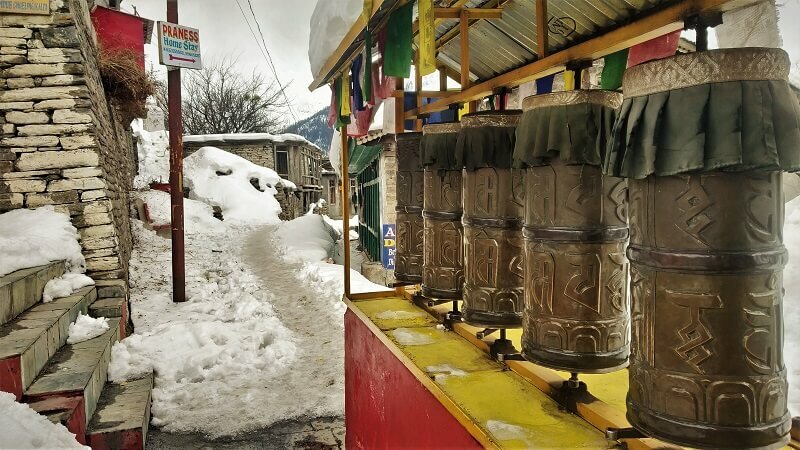 Once you reach Reckong Peo, you can either opt for a bus/ shared taxi to reach Kalpa. 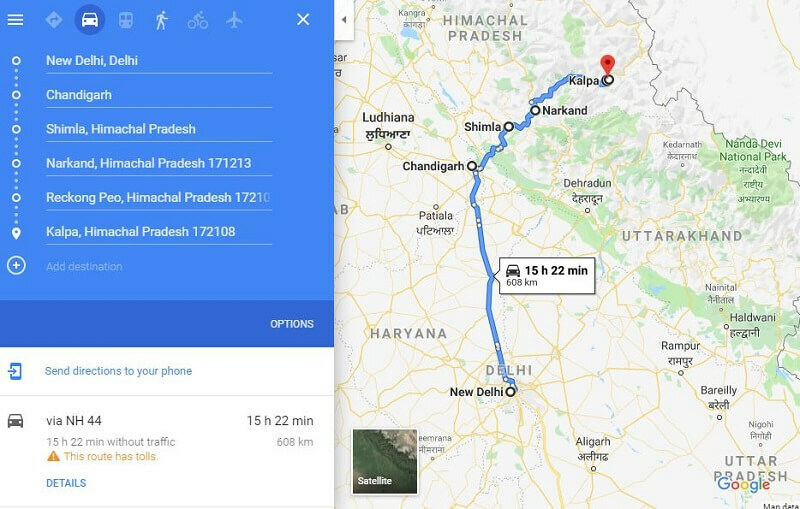 There are direct overnight buses from Delhi and Chandigarh to Reckong Peo as well, but it would be a long journey, so would recommend reaching in break journeys. 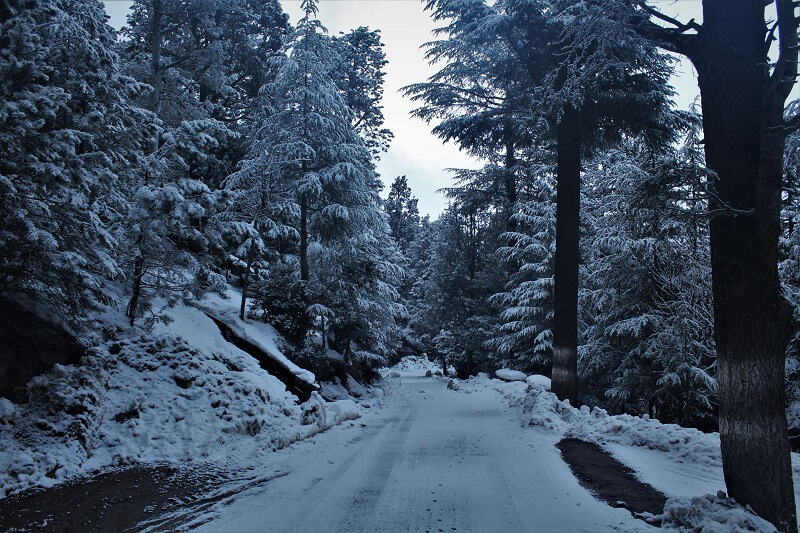 You can take a day’s halt at Shimla/Narkanda, I would highly recommend Narkanda as it’s a beautiful town. 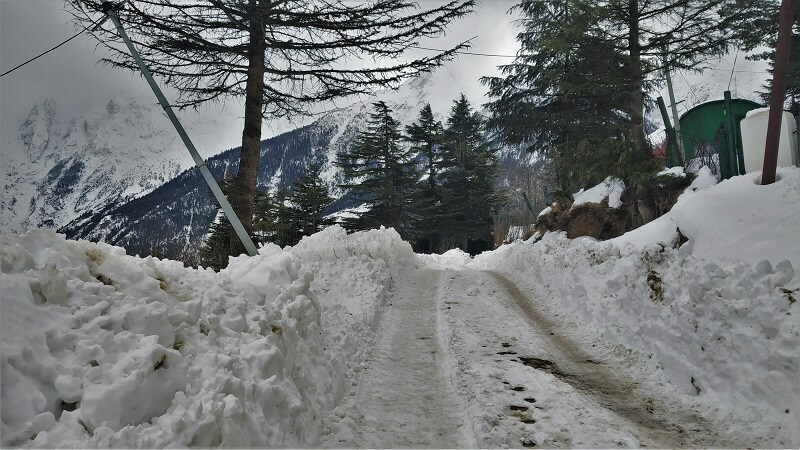 Remember, the road conditions are not that good and are prone to frequent landslides especially in winters and monsoon season, so always plan to keep spare days. 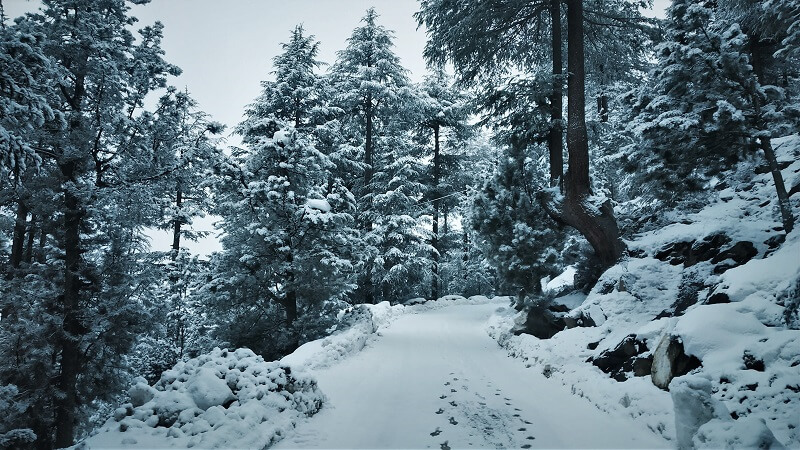 Also, in winters, snowfall is quite frequent and it may take a day or 2 to clear up the snow from the roads. 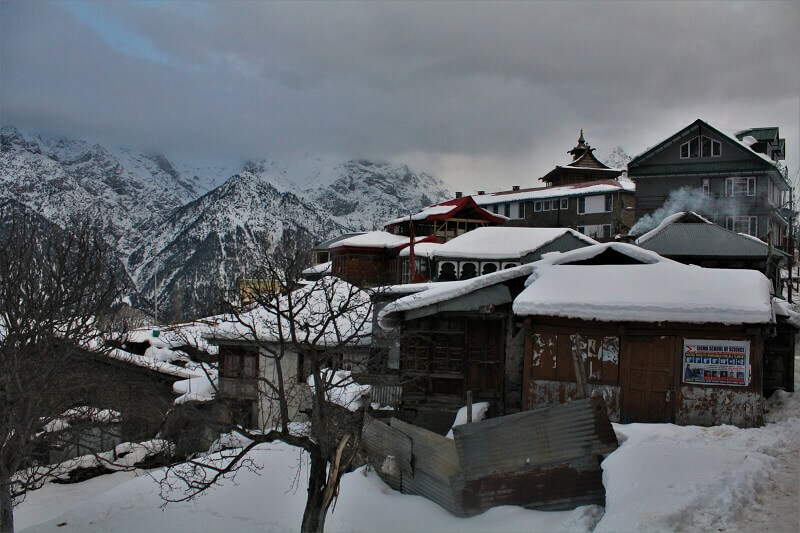 Kalpa in winters is mostly snow covered and strolling around is the only option to explore the town. Also, the town is very small and can be easily covered on foot. You can go on a leisurely walk to the Suicide point and all the way up to the Roghi village (5 kms – 1 hour). Except for the winter season, you will get transport for Roghi village as well. 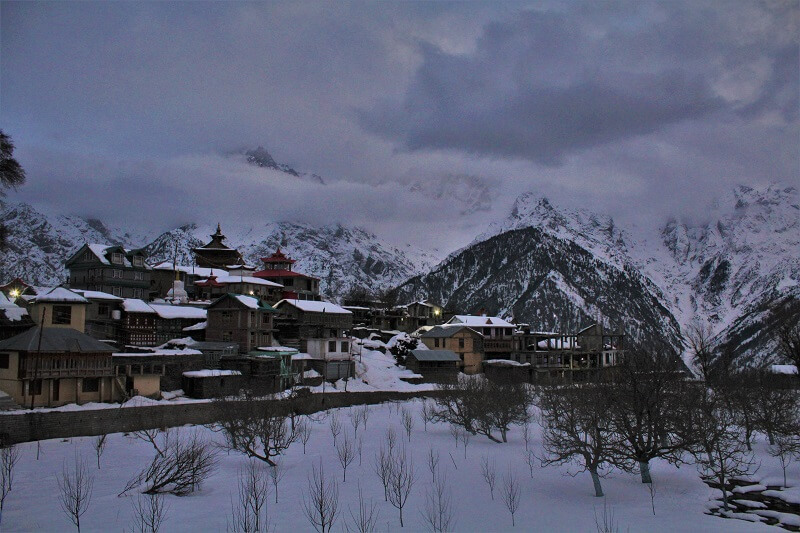 Walking all the way from Kalpa to Roghi village amidst snow-capped mountains is extremely delightful. 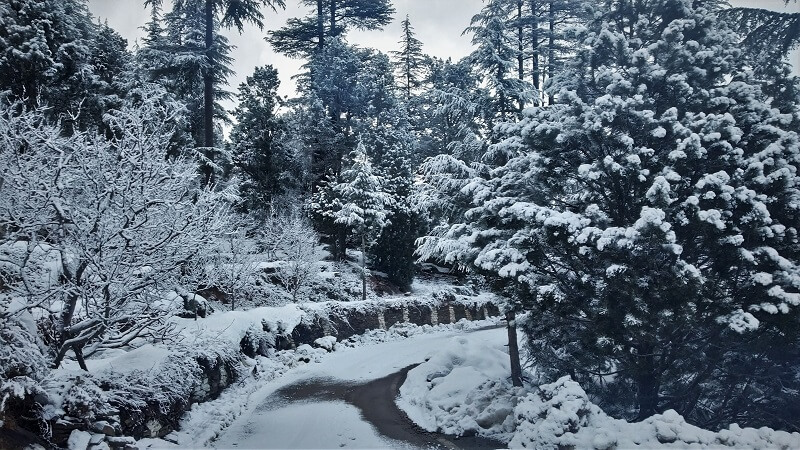 Which places comes to your mind when you plan a visit to the state of Himachal? 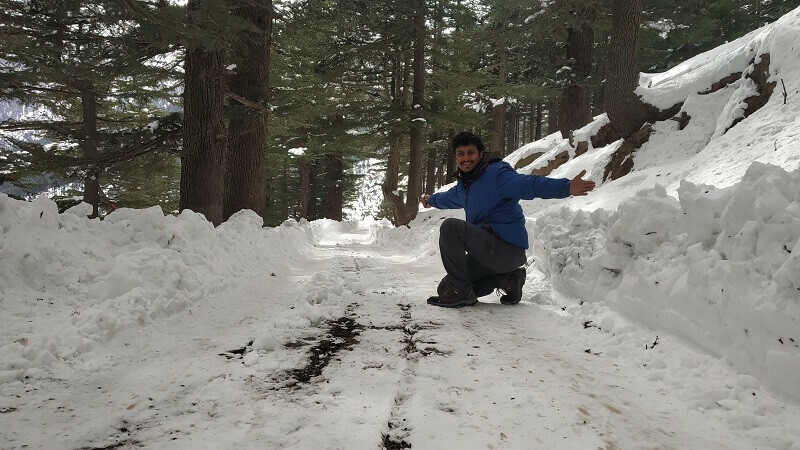 Shimla, Manali, Dharamshala, Dalhousie and Kasauli. Isn’t it? I agree these places are quite famous and are blessed with mesmerizing natural beauty. But aren’t these touristy towns too crowded? Personally, I don’t like visiting such crowded touristy towns and I am always looking for towns which are peaceful and less explored. And one such peaceful town with having natural beauty in abundance is Kalpa in Himachal. 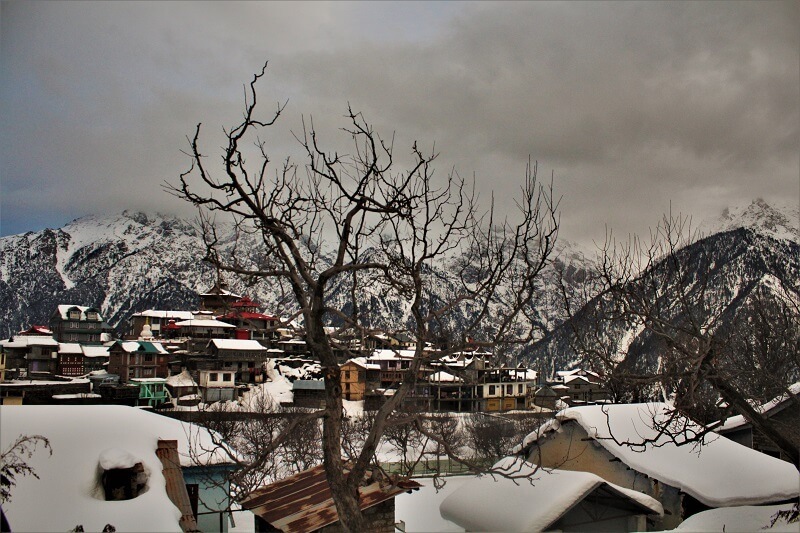 After exploring the last inhabited village “Chitkul” and making some lifetime memories, next on my list was Kalpa. I took a shared taxi from Sangla for Reckong Peo (INR 90). From Reckong Peo, one can reach Kalpa by taking a shared taxi/bus. Since the road route was covered with a thin layer of snow, the frequency of transport was very less. Luckily a taxi carrying goods stopped by me and asked if I wanted a lift for Kalpa. 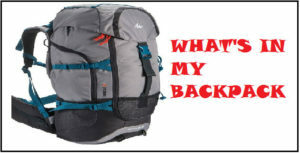 Though there wasn’t any seating space, I could stand at the back where the goods were kept. The memories of Munsiyari flashed in front of me where I did the same. 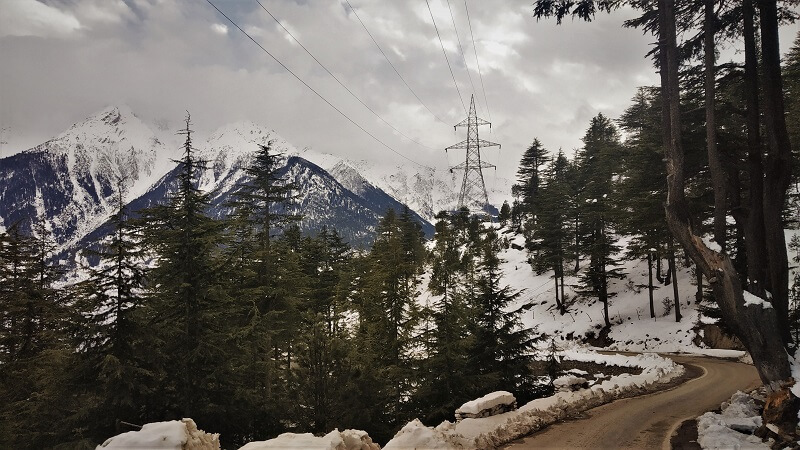 The curvy snowy roads, the snowcapped mountains in the vicinity, and the peaceful road route, oh, this 10-minutes ride to reach Kalpa was such an amazing experience. The entire town was covered with thick snow due to the record-breaking snowfall this year. Almost all the hotels and stay options were closed, I was lucky enough to get the only homestay open in the entire town. There is nothing much to see in Kalpa. What it does offer in plenty of peace and tranquillity. Come to Kalpa if you want to spend some time away from the crowded city life. 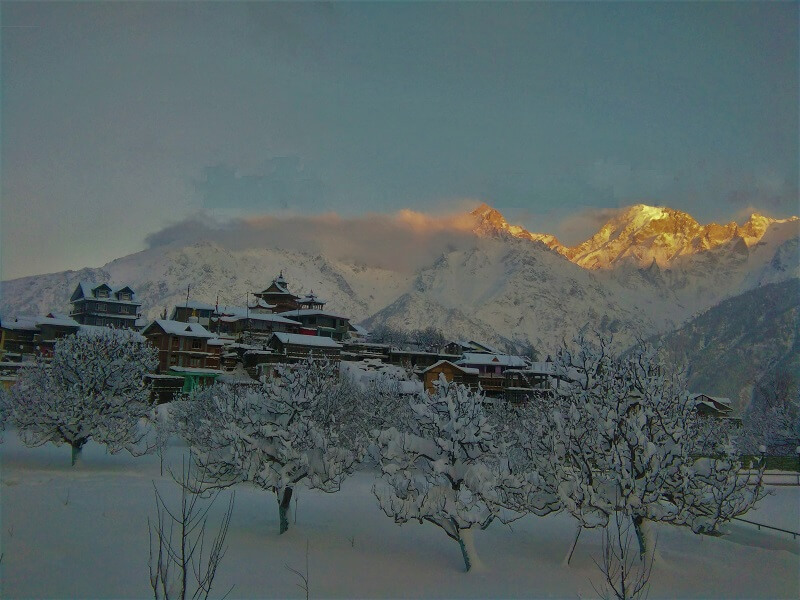 Kalpa is pure scenic beauty, huddled under a snow blanket, and with snowcapped Kinnaur Kailash in the vicinity. Watching the sunrises and sunsets from the town is absolute bliss. 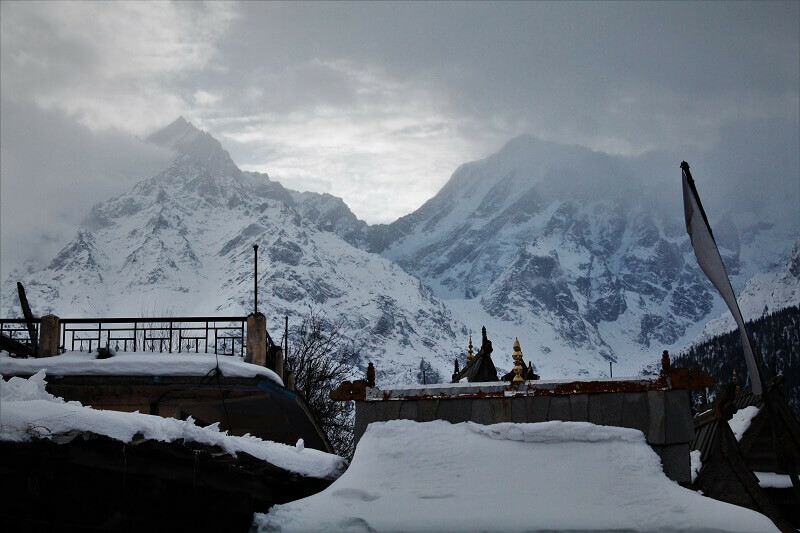 The Kinnaur Kailash mountain range, wrapped in a white sheet of snow, appeared no less than a fairy tale land. Sitting in the balcony of your hotel, doing nothing and sipping down some hot tea, while staring at the snowy peaks in front is an amazing feeling. The Kinnaur Kailash Shivlingam, a 79-foot vertical rock in the Kinnaur Kailash mountain range is the major attraction of Kalpa. The main sources of income for the locals are from apple farming and the tourists. Kalpa has got one of the best apples grown in the entire world. One can take a leisurely walk/transport to the suicide point and further to the Roghi village. On my visit to the town, the road route was entirely covered with snow, so walking was the only option. It started snowing while I was on my way to the Roghi village and the only colour I could see was white. It seemed somebody had painted a drawing of a town and forgot to put in colours. It was white heaven!! I am literally getting goose-bumps while imagining all this right now. 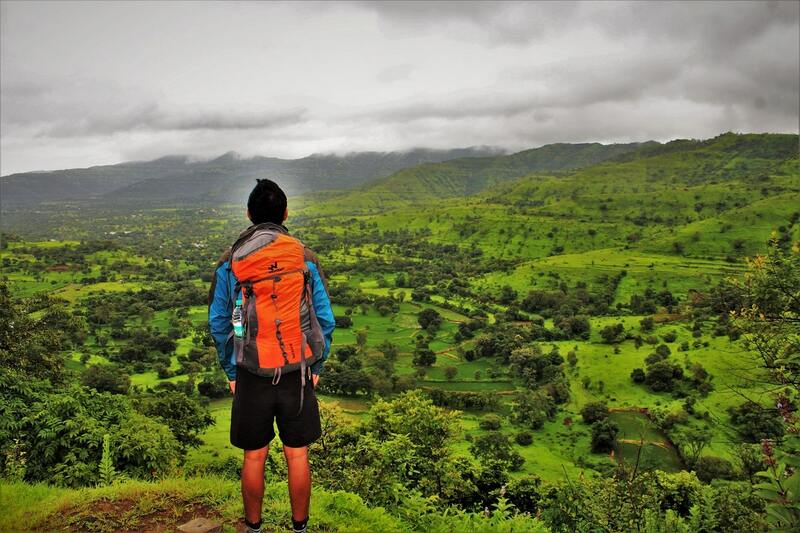 If you have time left, you can explore the nearby Chini village, Kothi Village or go for the Chaka meadows hike. 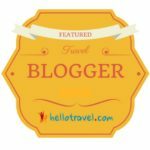 Kalpa is not really a place where you can have things to do or touristy places to go list. It is to sit back, relax and enjoy the views of the surroundings, take long leisurely walks to nearby villages, try out the local food, enjoy the local drink and breath in some fresh air. 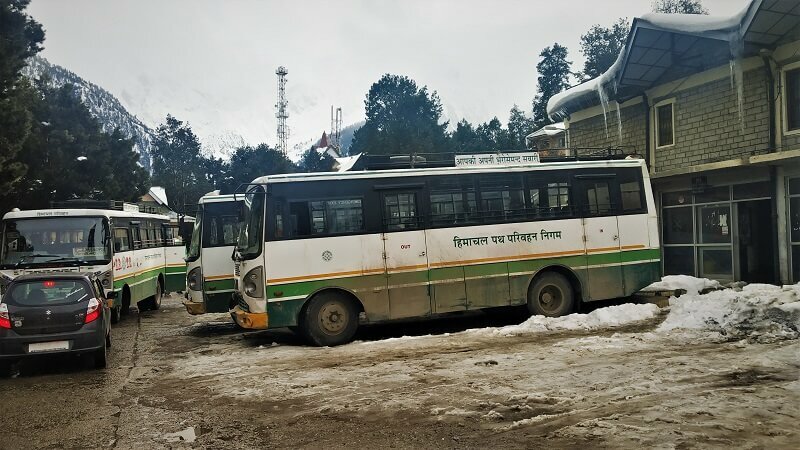 After spending a magical day at Kalpa, I headed for the Reckong Peo bus stand from where I needed to take a bus for Kaza. 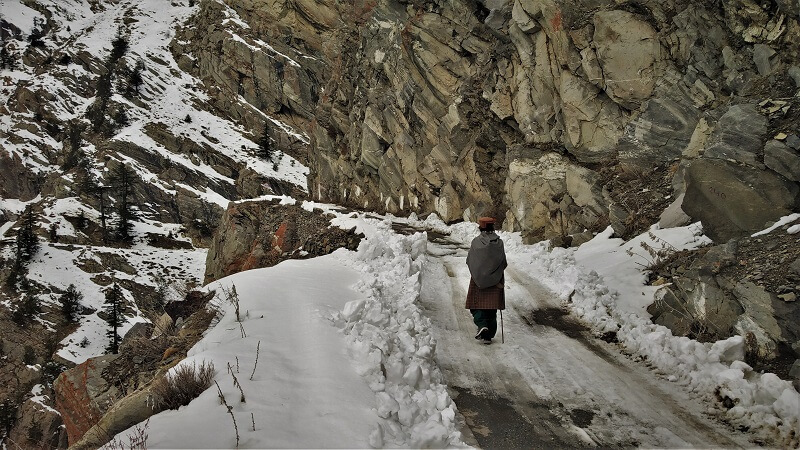 I had to walk all the way from Kalpa to Peo as it was early morning and there was no transport. There is Punjab national bank and its ATM at Kalpa. A medical facility is also available at Kalpa but bigger hospitals are at Peo. The mobile connectivity is excellent in Kalpa and almost every mobile network works here. The fuel station is available at the nearby town Reckong Peo. 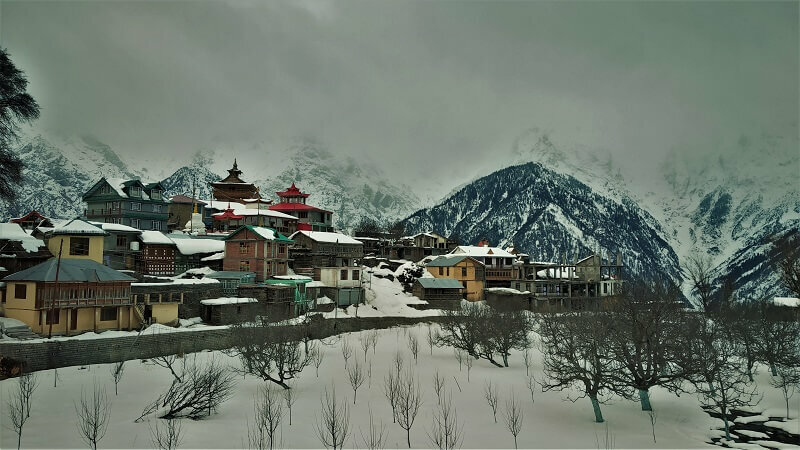 The best time to visit Kalpa entirely depends on what you want to experience. Kalpa remains cold almost for the entire year. 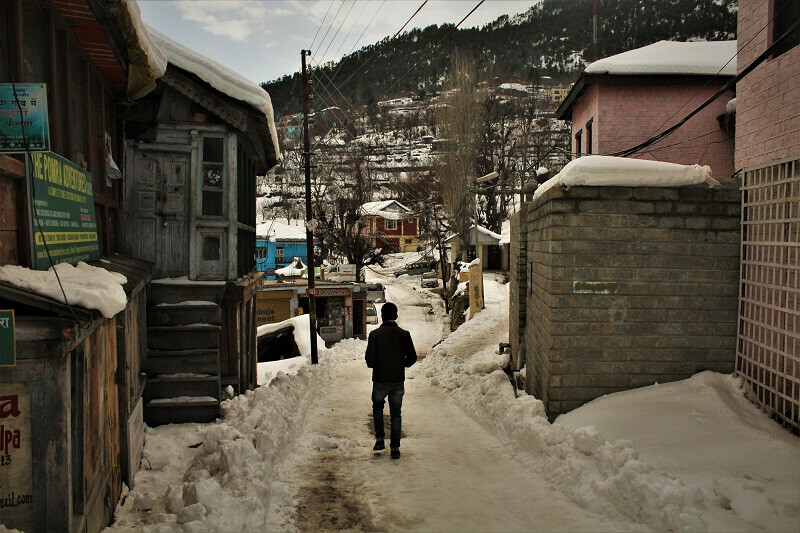 In the winter months (December – March), the town experiences snowfall and temperature dips below zero degree Celsius. In summer months, if you want to escape the scorching heat prevalent in other parts of the country, Kalpa is the perfect place to be at. Monsoon months of July and August bring rains to the region and landslides become common, so one needs to be extra cautious. In the winter season, most of the eat out joints remain closed and for food, you would have to entirely depend on the home-stay where you are staying. You must try out the local tea – Cha which is a salty Kinnaur tea. If you consume liquor do give a try to the local drink made out of the apple. Most of the hotels/home-stays remain closed in the winter season, so you are not left with many choices. 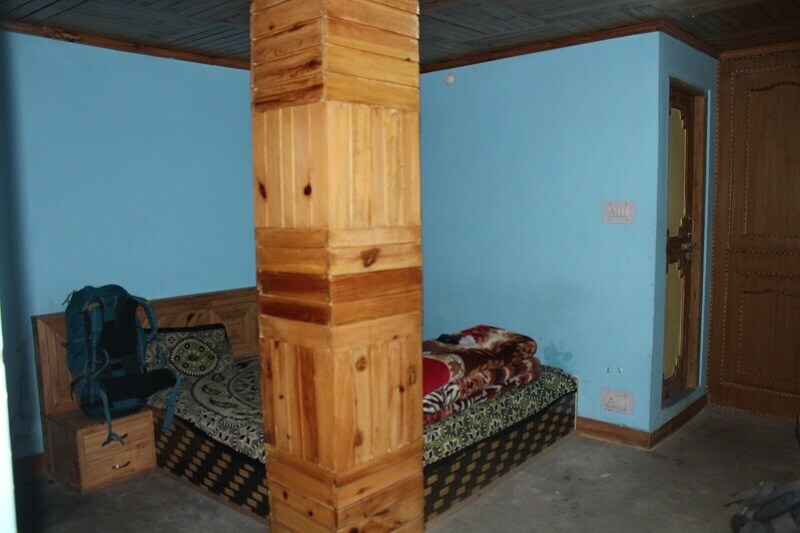 I stayed at Praness Home-stay(Mob:9816053257) (INR 500) and would highly recommend it. Also, you can opt to stay at Reckong Peo which is just a 10 minutes’ drive away and has a lot of stay options available. Do check out PWD guest house at Reckong Peo. I was left stunned by the beauty of the town Kalpa. I would have loved to spend more days exploring the nearby areas of the town but since I was short of days and wanted to cover Spiti Valley on this particular trip, it was time to say goodbye to the splendid town. I am surely coming back to Kalpa very soon!! 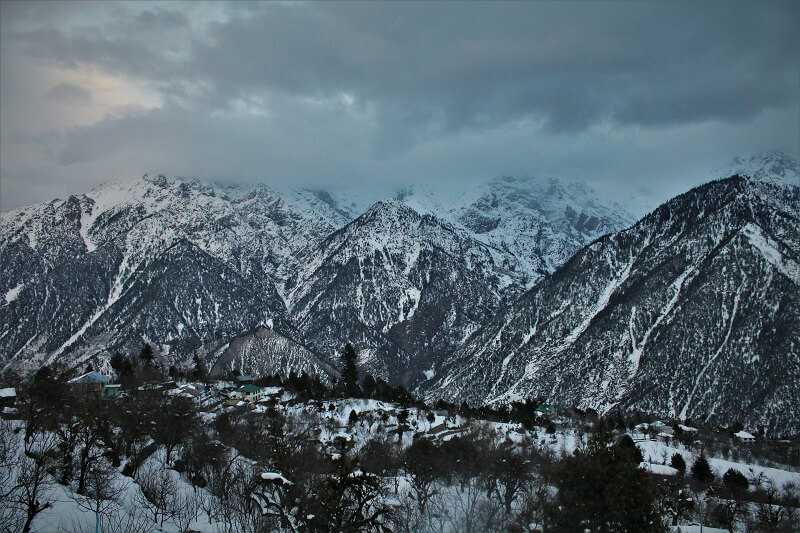 Hope you would have enjoyed reading this article/ travel guide on Kalpa in winters. 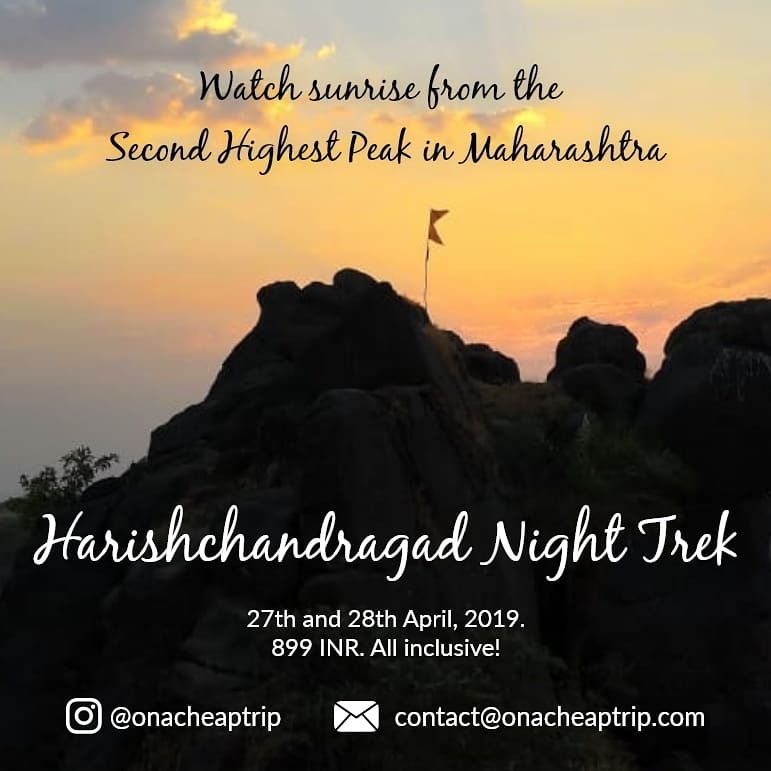 To get regular updates on upcoming blog posts from On a Cheap Trip, please subscribe by entering your name and E-mail address in the Newsletter below. You can follow me on Facebook, Instagram, Pinterest as well as on Twitter.